We had a party at Pear Tree Farm. The sun was shining, the blossoms were blossoming. My little girl was having a blast with her cousins and her aunties and uncles and grandparents. It was just so special to be able to share our home with our family, so lovely to have everyone around us and delighting in our girl. What a privilege to have family. 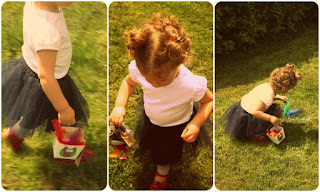 We started off Miss O's party with a treasure hunt, following a trail of coloured feathers scattered around the farm. The little ones (Miss O and her two cousins) absolutely loved hunting for these 'treasures' together and collecting the feathers in their little baskets. The trail of feathers eventually led to one of the little toy owls I have been making. Each one was tied to a tree with their names on them. My little 3 year old nephew decided he would name his owl Beastrice (yes you read it right....Beastrice the Owl)...priceless. While the family were gathered we also a had a dedication for Little O and both 'Grandpa' and 'Poppy' shared their thoughts about Little O and prayed for her and for us. It was so precious. My sister made the most beautiful cupcake birthday cake for Little O....who promptly shoved a whole cupcake in her mouth in one big gulp...mmm. It was a glorious day and so nice for me to be sitting outside lapping up the sun and fresh air. I couldn't help but reflect on how blessed we are to have family and to be able to celebrate such special times together. Thanksgiving party anyone? Christmas, New Years? Australia day??! I'm so looking forward to the warmer weather and summer bbqs....mmm delicious!! So there you have it, our party on Pear Tree Farm. My gorgeous girl is "Two Old" as she likes to tell me. It gives my heart just a little pang, as I realise she is growing up so fast, so beautifully, so fun. So fun to be with. Happy Birthday my Gorgeous Pea!